1. 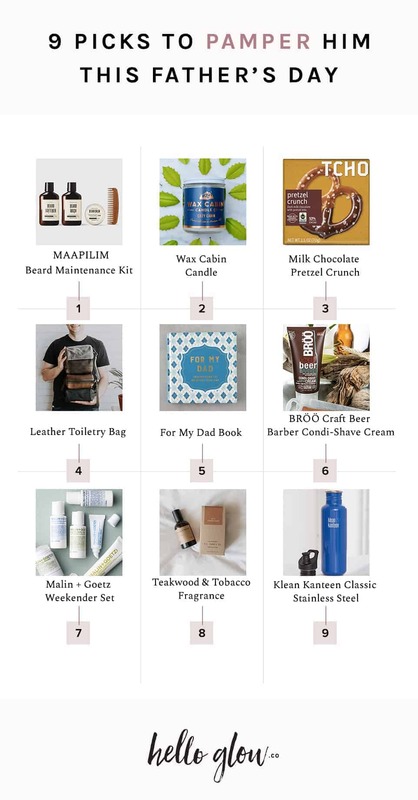 MAAPILIM Beard Maintenance Kit // This kit of Maapilim beard essentials includes everything he needs to give his beard the attention it deserves. 2. Wax Cabin Candle // “Cozy Cabin” is a soy based candle that combines sweet tobacco and leather, a warm yet masculine scent. 3. Milk Chocolate Pretzel Crunch TCHO Bar // For the dad with a sweet tooth, these gourmet bars combine salty, crunchy pretzels with creamy milk chocolate. 4. Pegai Leather Toiletry Bag // These minimalist toiletry bags are handmade from genuine leather, making them long-lasting and timeless, too. 5. For My Dad Book // This small books gathers an array of quotes that will make even the toughest dad melt a little! 6. BRÖÖ Craft Beer Barber Condi-Shave Cream // Beer saves the day! This 2-in-1 product is a shaving cream that doubles as a beard conditioner and it’s made with clean ingredients – including beer! 7. Malin + Goetz Weekender Set // Ideal for the frequent traveler, this set of grooming essentials includes everything from hand creme, cleanser and face moisturizer to body wash and lip moisturizer. 8. Teakwood + Tobacco Fragrance // This unisex fragrance features a subtle musky scent thanks to a sandalwood, cedar and patchouli base, a heart of black tea and black pepper, plus top notes of orange, tobacco, and amber. 9. Klean Kanteen Classic Stainless Steel // This classic design is made from durable, easy clean stainless steel topped with a chip-resistant powder coating, making it ideal for adventures inside and out of the city. These are great tips, thank you so much for sharing! !